I came across these cheery assorted painted tin planters in the April issue of Italian home decor magazine, Bravacasa this past week and thought one could create something similar for a weekend project. The magazine says these are painted paint cans (although they look store bought or professionally made to me) –notice the cut-out cross shape on the bottom with a metal mesh netting for drainage. In searching on how one could paint paint tins, I came across a clever DIY to make painted paint tin bird feeders (photos below) by Sara at Mom Endeavors - another project definitely worth checking out. I liked her idea of rolling on the paint. For this project I think assorted colours is the way to go and the glossier the paint the better. Happy making! Tania - send pictures if you do! These are so pretty! I love the assorted sizes and colors. 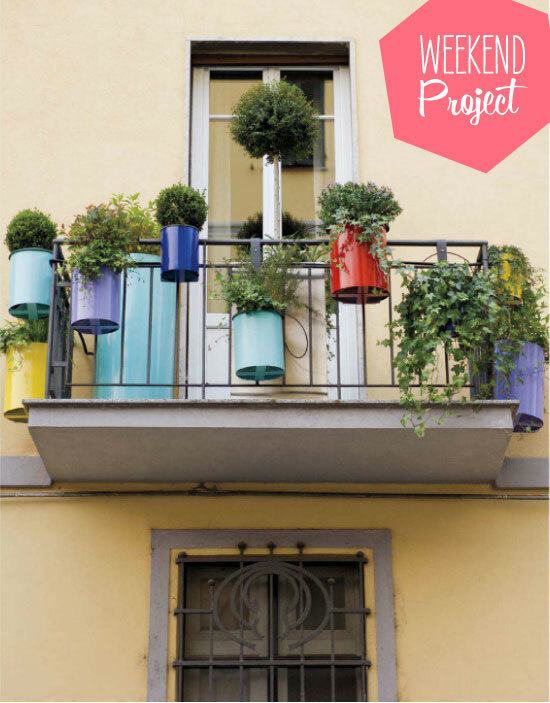 The aesthetics of my European balcony pale in comparison to this one in Italy, but these tins are a great idea for brightening things up! Nice project! I love it! !